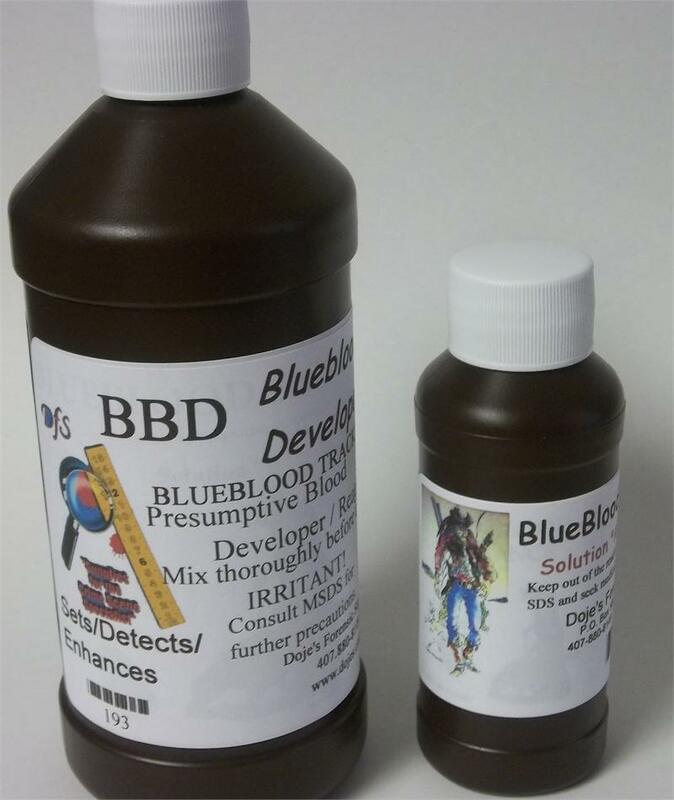 Doje's Forensic Supplies > BLOOD ENHANCEMENT > BLUE BLOOD DEVELOPER/ENHANCER - "BBD"
Blue Blood Developer - "BBD" represents a new twist on the original BlueBlood Tracker. BBD has been reformulated into the ultimate enhancement tool designed specifically for Law Enforcement. Here is a new technique for the detection and enhancement/development of blood patterns at the crime scene. 'BBD' sets the blood to a surface to keep it from leaching or washing away as the blood is enhanced. Blue Blood Developer is a catalytic reactive, multi-stain enhancement tool that sets and enhances trace blood at the scene for identification of friction ridges, footwear and other identifiers on the scene or at the lab.. 'BBD' is an exceptional tool. Ground Shipped only. 'BBD' comes as a boxed kit contains two bottles with mixing instructions, MSDS and spray head.